You want to see that row of 5 “green lights” for a clean bill of system health. If any of the indicators are red, you can use the plus signs at the far left to drill down into underlying information more deeply. Thus, for example, the first time I ran this tool to produce the screen shot for this blog post, I discovered I’d accidentally turned off the Windows Search service (which some Windows pundits decry, but which I have come to appreciate, thanks to its ever-improving built-in capabilities so readily available through the File Explorer search box, and other search boxes elsewhere in the system — as in the old Win7 position when using the Stardock Start8 Start Menu replacement tool, as I so often do). I had just finished fooling around with the latest version of Iolo’s System Mechanic (v11.7 Pro) on the system, and had apparently and inadvertently turned off the Windows Search service as part of their recommended “tune-up” settings. A quick jump to services.msc to restart the service and restore it to Automatic status, and I was back in (normal) business. 1. 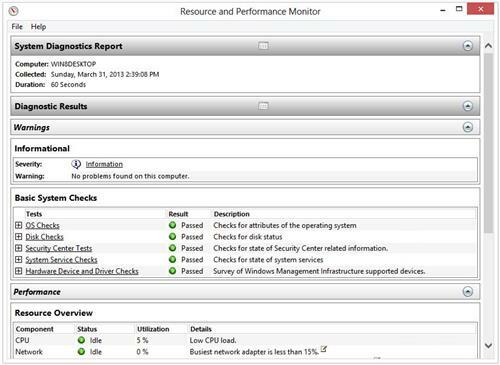 Performance provides an overview of resource utilization for CPU, Network, Disk, and Memory. 2. Software Configuration provides oodles of information from OS Checks, Security Center, lots of details on System Services, and Startup Programs. 3. Hardware Configuration covers various Disk Checks, System details, desktop performance rating data (from Windows Experience), BIOS info, and key Device Manager details. 4. The CPU heading provides information about running processes and their resource consumption (Image Statistics), Service Statistics, active/running services, and a raft of system performance counters and data. 5. The Network heading tracks protocol-related counters and data for TCP, the physical interface (data link layer), IP, and UDP, and provides great detail on network traffic levels and activity. 6. The Disk heading provides information on so-called “Hot Files” (major files that Windows uses heavily at run-time), disk activity, physical disks, and NTFS performance. 7. Under the Memory heading, you can examine RAM consumption by process, along with working set size, total commit charges, and distribution between shareable and private memory, along with all the major memory counters that Performance Monitor supports. 8. Report Statistics ties the report content to a specific PC and OS installation, with information about files run and created to generate the report, and events processed to obtain the report’s contents. Not only is this a useful report when checking up on a system, it’s also a quick and easy way to obtain (and even to retain) system state, health, configuration, and components/devices information for any PC on which it’s run. Worth getting to know!